In Bagong Silang sources of income are scarce, you either work from the tender age of 10 at the nearby asparagus farms of multinationals, make charcoal from whatever wood left in the area, or barbeque sticks which they spend hours making and sell for only several centavos a bundle. ​Bagong Silang's school classrooms open windows lets in the cool mountain air. According to the principal of the school, nearly adults aged 30 and above are illiterate. Of the 200 registered school-going children only about 50 attend. 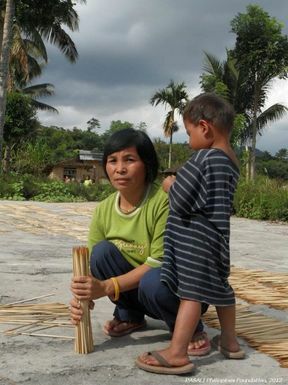 The rest work at nearby asparagus farms to earn money for their family's food. The teachers say if the school offered a meal that the number of school-goers would increase. When you meet the cheeky children in San Jose, you'd think they are so healthy but actually, their bloating faces are signs of protein deficiency. According to the principal and teachers of the school, about 7 of the 200 children from the school moved on to highschool in 2011. The nearest highschool is at the bottom of the mountain, 35 minutes via motor which they walk everyday. In 2010, a formal education was set in Bagong Silang, but 2 years back, Pasali has been giving Numeracy and literacy sessions in 3 villages including the Bagong Silang. Sitio Bagong Silang, San Jose, a mix of T’boli & Blaan IP community in General Santos City formally received ram pump last April 10, 2012 through the Agos Ram pump project funded by Coca- Cola in partnership with AIDFI & Earth Day Network Philippines, Inc. PASALI as the implementing partner did the groundwork and water installations, including the training of community technicians. The turnover was attended by the stakeholders, General Santos City mayor, PNP City director & company, and Department of Education officials and colleagues.Bagong Silang is the second recipient village of the, out of target 100 villages in the Philippines. The turnover hooked up the stakeholders. All went down together to visit the water source and experienced the hardship of the community to get water downhill. Now that they have a water pump, they don’t need to go down and walk a steeply journey for at least 30 minutes just to get water.